Tallahassee Alumnae Panhellenic – Page 3 – Alumnae Panhellenic of Tallahassee, Inc. APT Officers were invited to the FSU Panhellenic Recruitment Kick-off event this past week at Florida State University. 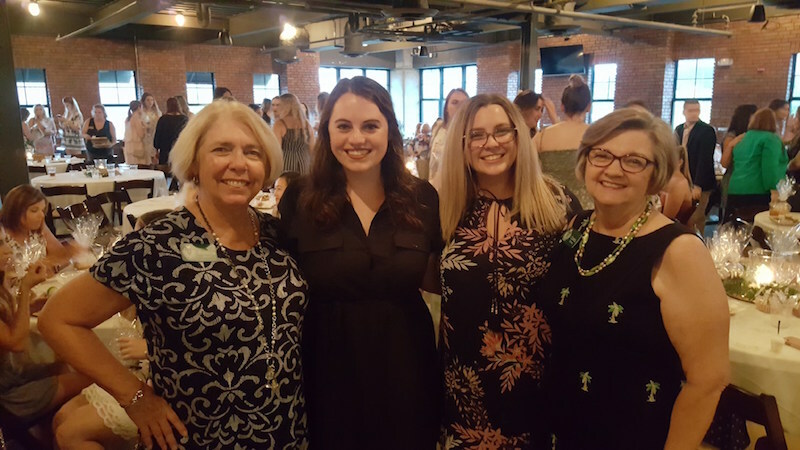 From left to right, above: APT President Patricia Scott, FSU Panhellenic President Jessica B., kick-off event chairperson Tilly V., and APT Past-President Carol Spring. The first meeting for general membership and especially officers and sorority representatives will be held on September 5th,2018 at Taziki’s Mediterranean Cafe, 216 S. Magnolia Drive #102, Tallahassee. The meeting will begin at 6 PM in the back area of the cafe that overlooks Magnolia Dr.
Small plates, beverages, and dinner may be ordered by attending members, at their own cost. The menu is available on line to preview. RSVP is not required, but appreciated to Patricia Scott by email or by phone, 239-848-6056. The agenda that night will include a discussion of our revised by-laws, a distribution of notebooks for each officer, prepared by Past President, Carol V. Spring, and calendar development for activities for the year. This year the events will have an overriding theme, to add cohesiveness to our year. The theme will be “Greek Champions.” Throughout the year APT will include events and activities that include successful Greek women. If the membership is aware of specific names of Greek women in any profession that would be interesting for the group as a whole to hear speak, please bring those names forward, with contact information if possible, to our first meeting on September 5. Because September 5th is our first meeting of the new (to us) year, we ask that all those attending the meeting bring a small item they have that represents their sorority years. Some ideas might be a piece of jewelry, photographs from activities, paddles, small composites, gifts from big or little sisters, etc. This will be our ice-breaker activity. Thursday, September 6th, we are again adding our support to the Hang Tough Foundation’s activity for children at Cascades Park, at their Cascades Goes Gold event. To celebrate Childhood Cancer Awareness Month, Cascades Park will be lit up Gold in honor of those currently fighting and those who were lost to a pediatric cancer. As we did in 2017, ATP will supervise games for children to play. We need volunteers to support the event. We had a blast last year and need members to again come out to join us. No experience necessary, just a willingness to have fun with kids playing games and handing out trinkets for participation prizes. Contact Patricia Scott by email or by phone, 239-848-6056, to sign up for a shift at Cascades Goes Gold.